Learn about rules for knives, dangerous goods, and other carry-on or checked baggage items concerned by many passengers. When boarding a codeshare flight serviced by another airline, the free baggage allowance indicated on your ticket will be valid in principle. For details, please contact us, the operating airline or your travel agency. 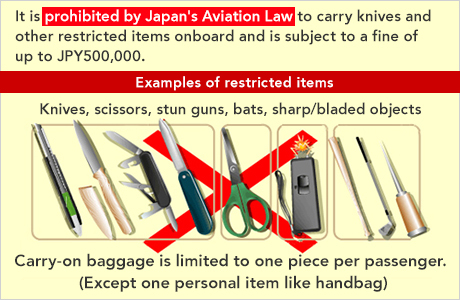 Carrying knives or other restricted items into the cabin is a violation of Japan's Aviation Law and subject to a fine of up to JPY500,000. If you are found to be carrying such items at a security check when departing from the U.S. or another country outside of Japan, you may be subject to fines under the laws of that country. The limitations of carry-on "Ink and Toner Cartriges"
* For details, please also check each airport information page. Can I carry a knife such as cutter knife or fruit knife onboard? Is it safe to put electronic devices such as laptop computers or digital cameras for X-ray scanning? There are volume restrictions for fluids that can be carried onto international flights. All liquids must be in containers with a capacity no greater than 100ml. 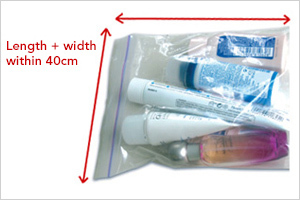 If traveling with more than one container, place all containers into a transparent and re-sealable plastic bag of a maximum capacity not exceeding one litre. If your bag exceeds size restrictions, please properly pack the bag, place it inside baggage to be checked, and inform the check-in counter staff. If your itinerary involves a transit, note that other countries have similar restrictions. These restrictions also apply to passengers transitting to international routes after arriving in Japan. Note that passengers carrying alcohol and other liquid goods purchased inflight or at a duty-free shop in a foreign country will be asked to dispose of them when going through the security check in Japan for the connecting flight. Please refer to the following regarding the restrictions for carry-on liquids. More than one lighter per passenger cannot be carried on board. Also, including any number of lighters in checked baggage is prohibited. Lithium battery-powered lighters must be Lithium content less than 2g or Watt-hour rating less than 100Wh and with a safety cap or functions of protection against unintentional activation. It is prohibited charging in the cabin. Lighters with oil tanks not containing absorbent material (cotton), cigar lighters/Premixing Lighters (those producing a strong blue flame) and pistol-shaped lighters cannot be checked in with baggage or carried on board. Please make sure not to leave any lighters in the cabin when disembarking. Lighter and match are prohibited in checked baggage to the cargo compartment and also in carry-on baggage on some international flights. Mobile phone, portable DVD players, radio equipment, transceiver, notebook PC, digital camera, mobile device, handy copy, printer, handy device, e-book player, portable game player, camera equipment, etc. Handlings vary depending on the lithium content. Handlings vary depending on the watt-hour (Wh) rating. �Lithium ion battery (including power bank) that allows charging of other electronic devices such as mobile phones, tablets and laptops. GPS tracking devices. Bluetooth, Wi-Fi capability. *2 Battery must be removed and the battery carried into the cabin. *Smart Baggage using a lithium battery content less than 0.3g or lithium-ion battery Watt-hour less than 2.7Wh can be brought into the cabin or handled as a checked baggage even battery cannot be removed. *Please check the handling of each battery for the number and capacity limit. Please carry the valuable items such as PC or tablet PC with you and do not include them in your checked baggage. Please take out your PC or tablet PC in advance and place them in the tray provided for security check. Please switch the power off completely (not in sleep mode) and take measures to prevent from unintentional activation or damage. Some Airlines may limit maximum quantity to electronic devices and/or spare batteries per person. Damaged, defective or recalled lithium batteries and lithium battery powered devices are not permitted to be transported. The items listed below should be carried with you and not included in your checked baggage. Cash, jewelry, precious metals, securities, bills of exchange, works of art and antiques. Documents, electronic data, passports and other personal identification required for travel, samples, credit/bank cards, cash vouchers, bankbooks, checks, commuter passes, keys, computers and computer accessories, mobile phones, film cameras, digital cameras, video cameras, medicines, paintings, watches, mementos, etc. Passengers may be prohibited from checking the following baggage. Please contact us or your travel agency for details. Please see the following page for information about dangerous goods. Transportable items are for personal use only.